A new film will be shot about the life of Ahmadiyya Jabrayilov, an Azerbaijani Resistance hero and National Hero of France. 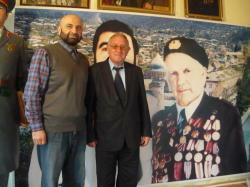 Azerbaijani, Russian and French filmmakers will join efforts for shooting of the film "Ahead of Generals". 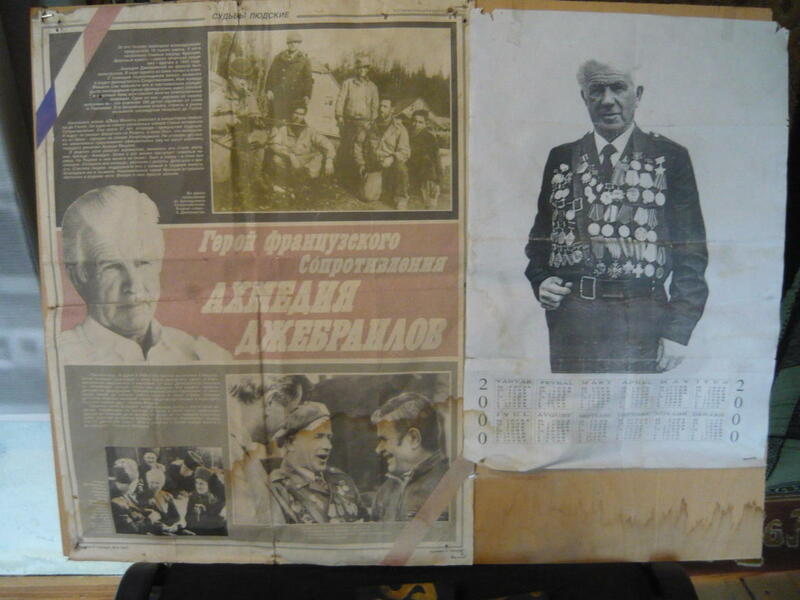 Anar Omarov, scriptwriter of the movie, said that he visited the legendary partisan's house-museum in Sheki, met with his son and got his blessing and legal agreement to use his father's name in the film. The film will be based on real-life events and mainly cover the activist's life during the World War II. The story of Ahmadiyya Jabrayilov is one of patriotism, valour, luck, and tenacity. In 1939, Ahmadiyya was called up for compulsory military service like all young men of his age. The new recruit was sent to Ukraine where he was part of the infantry stationed in the town of Lviv. At the start of Operation Barbarossa, the Soviet Union’s Sixth Army, in which the young Ahmadiyya was serving, was partially broken up by German troops before being immediately re-formed at the heart of the southern front. As one of the 240,000 Soviet soldiers taken prisoner whilst launching an offensive against the Nazis near the Izyum Bridge over the Don, Ahmadiyya was transferred to many camps, eventually ending up in a camp in Frankfurt-an-der-Oder, near the Polish border, for Soviet soldiers from the Soviet Republics. Refusing to join the Nazi cause after promises were made regarding the independence of Azerbaijan following a Nazi victory, he decided to escape and rejoin the Red Army. Surviving forced labor and considered to be Jewish, he underwent sadistic experiments with hydrogen cyanide. Later Ahmadiyya was assisted by a Turkish-speaking cleaning woman and escaped using a ruse of a fake ‘burial’. The way he survived is incredible. Ahmadiyya reminded Janna of her own son and she promised to help him but first he had to regain his strength. The brave woman began to smuggle him medicines and food, antibiotics. Some time later, Ahmadiyya told her that he was able to walk unaided and ready to escape. But leaving the Burloup barracks was not easy, if not impossible, without outside accomplices. After thinking for a few days, Janna came back with a proposal, which left the young man speechless. He would have to swallow a powerful sedative based on barbiturates in order to faint. Janna would report his death and arrange his ‘burial’. Then Janna’s accomplices would disinter him and take him to a safe place. Soon, Janna reported the ‘death’ of a ‘volunteer’ to her superiors and arranged a ‘dignified’ burial since the ‘volunteer’ reminded her of her son. Once authorisation was given, Ahmadiyya’s body, almost lifeless because of the barbiturate, was put in a coffin and buried in the cemetery in the presence of several Volga Tartar ‘volunteers’. As soon as the pallbearers left the cemetery, Janna’s accomplices dug up the coffin and freed Ahmadiyya who was still unconscious. He ‘came back to life’ in Janna’s house. Thereafter he joined the French Resistance. He blew up those restaurants and cafés known to be frequented by Nazi officers, and sabotaged bridges and railway lines. Nicknamed ‘Kharko’, the Gestapo placed a price of DM10,000 on his head, and he joined the Maquis of Cabertat in 1944. Following the liberation of Toulouse in September 1944, he met General Charles de Gaulle, and after the liberation of the Midi–Pyrénées, he joined the Third Hussars Regiment, with whom he participated in the Battle of the Vosges and the liberation of Mulhouse and Belfort. 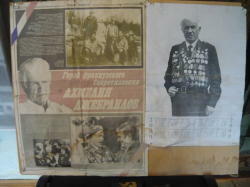 Thereafter, he was forcibly repatriated to the Soviet Union, following the Franco–Soviet Pact, where was tortured by the NKVD and condemned to forced labor. However, his bravery was belatedly recognized in 1966, when President General de Gaulle made his second visit to the Soviet Union. By this time, he had returned to Sheki, but General de Gaulle’s request to see him resulted in overnight fame. He became a National Hero of France, and received the Croix de Guerre, the Cross of Military Valour and the Medal of the French Resistance, amongst other acknowledgements. 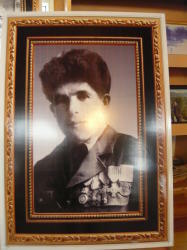 His life was ended at the age of 74 by a car accident in Sheki.